Thereands an interesting link between yams and unpleasant menopausal symptoms. Wild yam extracts have been studied as a possible remedy, due to steroidal saponin compounds, but thereands been nothing conclusive so far. Among the saponin compounds is a chemical known as diosgenin, which tests have shown to exert a positive impact on hormonal patterns, and possible benefits for lowering the risk of osteoporosis. One yam variety, Dioscorea bulbifera, was found in another study to improve ventricular function and protect the tissues surrounding the heart. Yams are thought to have originated in Asia, carried to Africa around the first century before being transported to the Caribbean with the slave trade. yams appear very similar to sweet potatoes, theyandre quite different. In fact, theyandre not even related. Yams belong to the Dioscoreae or morning glory family, while sweet potatoes are from the genus Convolvulaceae. Yams (from the African word andnyami,and meaning andto eatand) have only one embryonic seed leaf, while sweet potatoes have two. Yams may be undergoing an identity crisis due to frequent comparison with sweet potatoes. Though yams donandt come close to the vitamin A content and carotenoid presence, this world-traveling tuber has a unique set of phytonutrients. Besides strong antioxidants, including the enzyme superoxide dismutase, yams contain vitamin C, fiber, potassium, manganese, B vitamins, and a long line of other minerals like riboflavin, potassium, iron, and manganese. 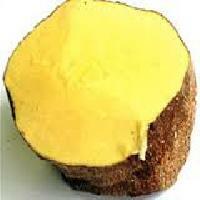 Yams are very high in beta carotene vitamin B6. Vitamin B6 is particularly helpful to individuals with heart problems, as B6 is known to break down homocysteine, which damages blood vessel walls. Yams are also high in the mineral potassium, which aids in controlling blood pressure, and also provides a good source of fiber. 100 g provides 118 calories. It mainly composed of complex carbohydrates and soluble dietary fiber. Together, they raise blood sugar levels rather very slowly than simple sugars and therefore, recommended as the low glycemic index healthy food. In addition, dietary fiber helps reduce constipation, decrease bad (LDL) cholesterol levels by binding to it in the intestines and prevent colon cancer risks by preventing toxic compounds in the food from adhering to the colon mucosa. 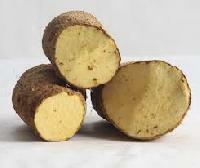 The tuber is an excellent source of B-complex group of vitamins. It provides adequate daily requirements of pyridoxine (vitamin B6), thiamin (vitamin B1), riboflavin, folic acid, pantothenic acid and niacin. These vitamins mediate various metabolic functions in the body. 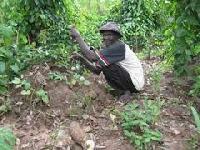 Fresh root also contains good amounts of anti-oxidant vitamin;andvitamin-C. Provides about 29% of recommended levels per 100 g. Vitamin C has important roles in anti-aging, immune function, wound healing, bone growth. The tuber is indeed one of the vegetables rich sources of minerals like copper, calcium, potassium, iron, manganese, and phosphorus. 100 g provides about 816 mg ofandPotassium.andPotassium is an important component of cell and body fluids, which helps controlling heart rate and blood pressure by countering hypertensive effects of sodium.andCopperandis required in the production of red blood cells.